Coiltek 6" mono Tdi coil. First impressions. Other coils, medium and large were also ground tested at the same time. White's 12 mono, White's 12 Duelfield, Jimmy Sierra (Made by Miner John) Digger coil 14x8 mono, Detech 15x10 mono, Miner John 12 x 8 folded mono, Miner John 11x7 mono, Detech 11 x 6 mono. Same settings with Tdi Pro, gain 5, Frequency to the left, Pulse delay 10, ground balance between 8-9, conductivity ALL. Only the White's 12 Duelfield had difficulties with the ground, it managed but was a little unstable and noisy whilst getting the job done.. The smaller coils seem to compare well with the larger ones, better on the small stuff and not far behind on the larger targets at depth. Interesting.. end to my coil tests. Posted results and Kerry aka 'mntnflyr4fun' has done a great job with a spreadsheet on findmall. Much more user friendly format..
Full credit to him, my results were a bit of a mess..
Just traded an old coil for a White's SuperPulse 220 mono coil. Pretty sure these were meant for the African market but White's USA go rid of them recently with a special sale. Just a few photographs so you can see what I'm on about. Same coil housing as Eclipse 950 etc..
Air tests as follows, White's Tdi Pro, ground balance OFF, conductivity ALL, gain on MAX, Frequency in middle using built in speaker. No EMI issues despite suburban setting etc. Quiet stable coil. Hits hard for about 80% of detected depth and tapers off for the last 20% of detected depth. This varies but is a rough estimate depending on the target. It is only an air test, real world ground tests will be different. All repeatable and clear signals, no whispers counted etc.. 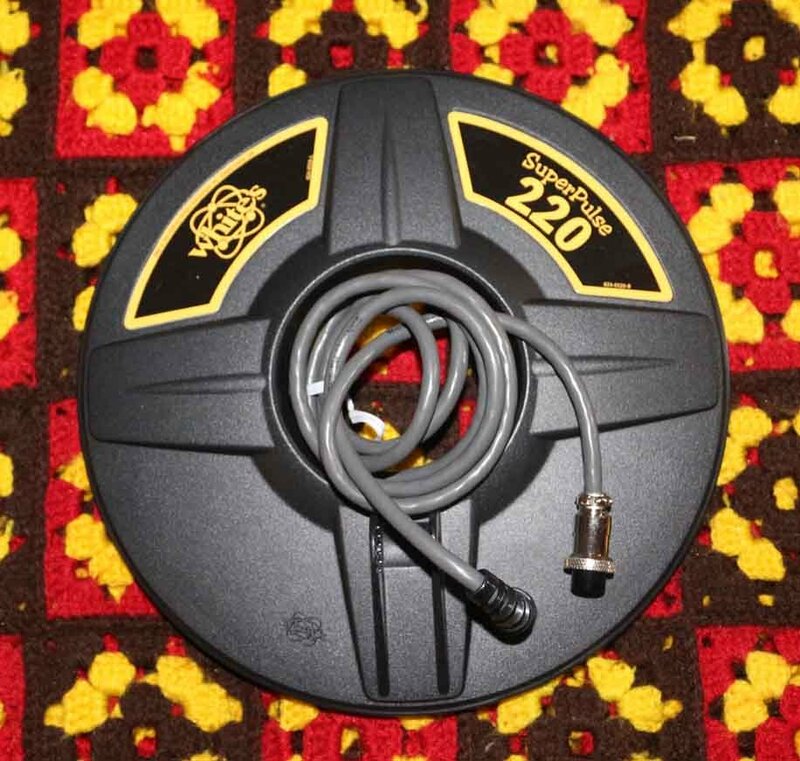 I think these SuperPulse 220 coils were dumped by White's at US $40 each, our American friends got a good deal.. 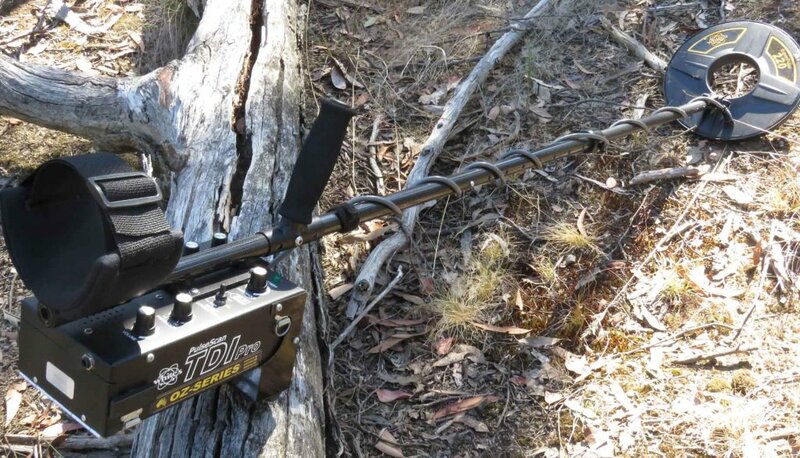 The SuperPulse 220 was mounted on my Tdi Pro Oz and taken out into the goldfields. A few days out visiting areas around Wedderburn, Dunolly and Talbot. No problems with ground balance, performed well and seemed stable. A bit of gold would have been nice but it did find the usual trash and at good depths. Small bullet fragment, copper jacket found about eight inches in shallow rocky ground; all that excitement for nothing... Balances nicely on the end of the machine, no noise when bumped, waterproof, White's quality.. Looking forward to some beach time in the near future. 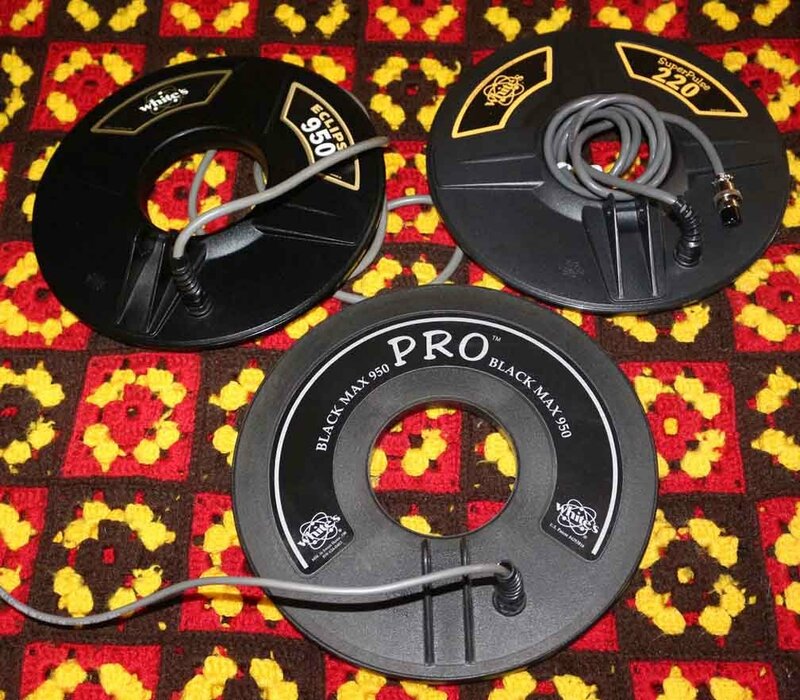 Impression is it is a decent coil with good performance. I suspect it will be spending most of it's time on the Melbourne beaches this summer, but at least I know it can also handle hot ground and may be called upon to do some more prospecting in the future. I had the chance to borrow a Nugget Finder 14 x 7 mono, I've got it for a while so I took the opportunity for a useless air test. This coil on the Whites Tdi Pro likes a decent sweep speed for best performance as do some other 'larger' coils. It is long and thin at 14 x 7 and I'm looking forward to taking it into the goldfields to gain some more experience with it. Picked up more EMI in the suburbs than Miner John and Razorback, Detech 15 x 10 is quieter. deeper. Detech 11 x 6 seems to hit harder..deeper but it is early days. In the ground is what counts. Given time I'll head out and do some prospecting and ground testing with this and the Super Pulse 220. Thank you for all the test results and time to put this on here. I bought a used Whites tdi sl and after I got it one of my friends told me that I had made mistake as it would not perform good in the Goldfields of California. But after reading this post makes me think different. 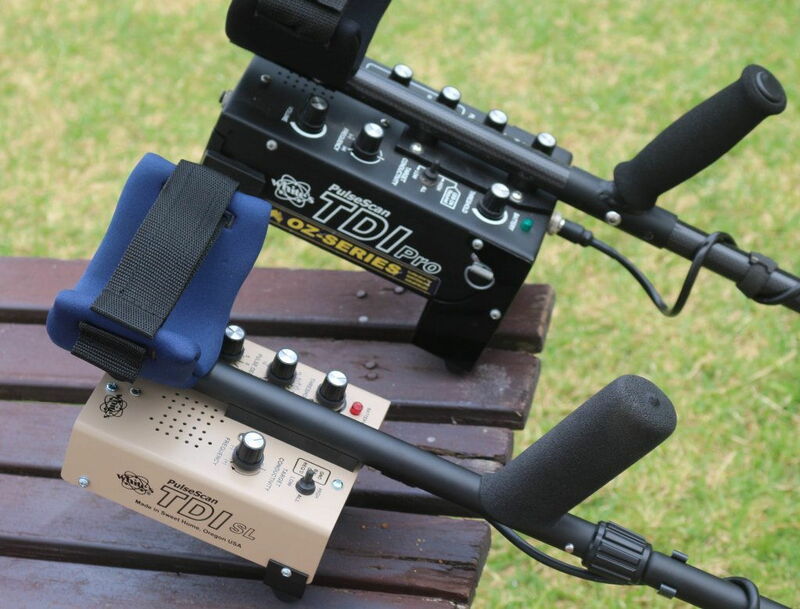 Do you think the TDL SL is the same as the TDI pro just a lighter version ? Found this info that might answer that question. To understand why there are three models of the TDI you have to sort of understand the evolution of this detector. First, the TDI is the result of an agreement between White's and Eric Foster who designed the GS 5. The TDI is patterned after the GS 5. The initial sales were here in the US and no sales in OZ. Before any TDI's were going to be sold in OZ, Whites wanted to know for sure the detector would work well there. 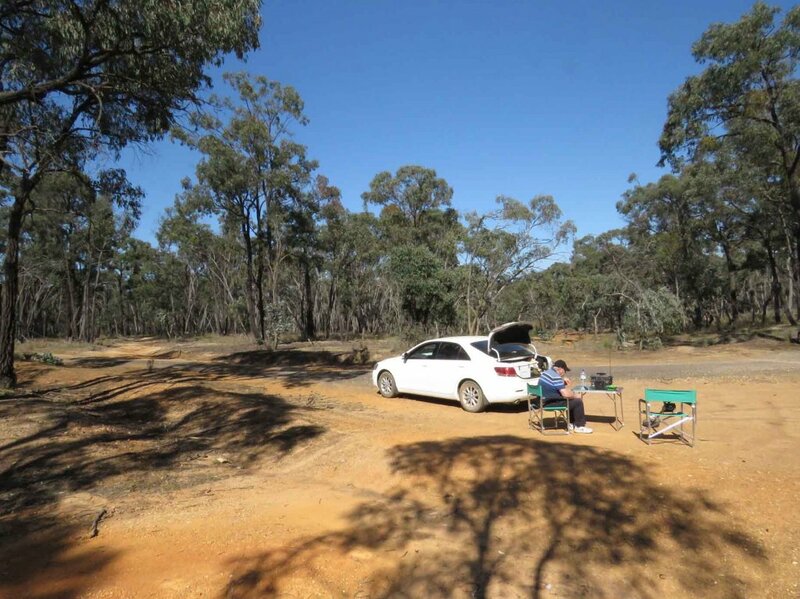 So, Eric Foster went to OZ and conducted various tests of the TDI on Australia's soil. What he found was in OZ, the Dual Field Coil, which is the standard coil here in the US didn't work as well as a straight mono coil, so a change of coils was made. Eric also found areas where the ground balance (Gcool smiley was too touchy and this led to the addition of a vernier GB control and a volume control. Also, some of the key users of the detector wanted a little sharper response, so a small change was made in the circuitry to sharpen the signals on small gold. 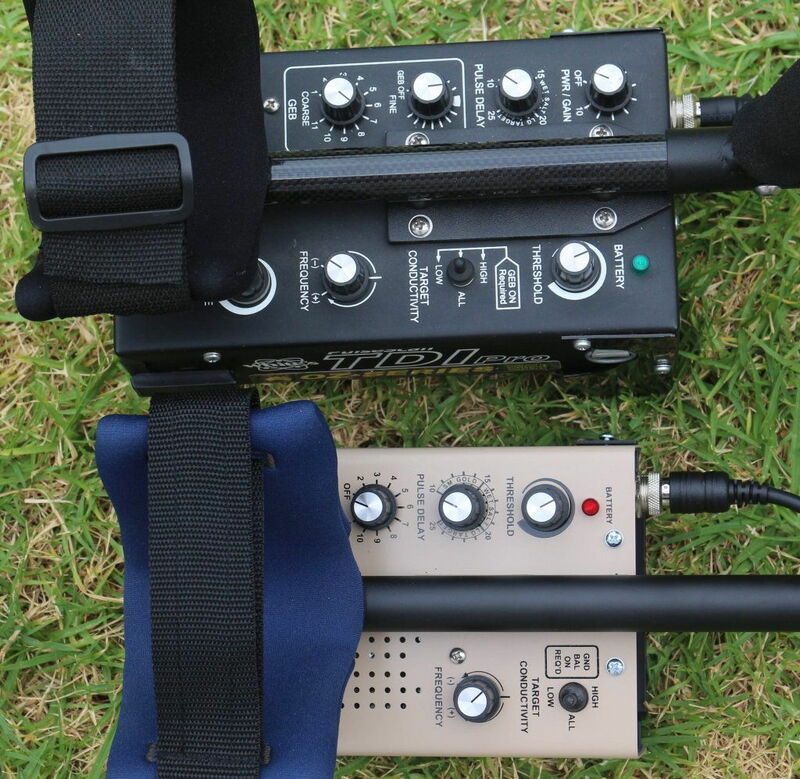 So, to provide a detector that worked about as well as it could in OZ, the following changes were made: A mono coil is the normal coil, a small filter change to enhance signals from small gold, and vernier GB control to make it easier to set the GB correctly for the best results and a volume control was added. These changes were implemented in what is now the TDI Pro. Thus, the TDI pro was built to be the main White's PI detector to be sold in OZ. However, because of the extra features, many people preferred this new model over the standard TD and it has become very popular here in the US also. Later, a new design develoment led to a special noise reduction feature presently only on the TDI SL and that feature was added to a new detector. White's also wanted a PI that would or could use less expensive batteries and again, this feature was added to the SL. Finally, White's wanted a lighter PI and again, this was one of the objectives of the SL. So, the orginal TDI evolved with the help of actual on site testing into a different model better suited for use in OZ. Later designs plus the desire to make a lighter PI that could use lower cost batteries finally led to what is now known as the SL. Part of the reason the SL costs less is the use of less expensive batteries. 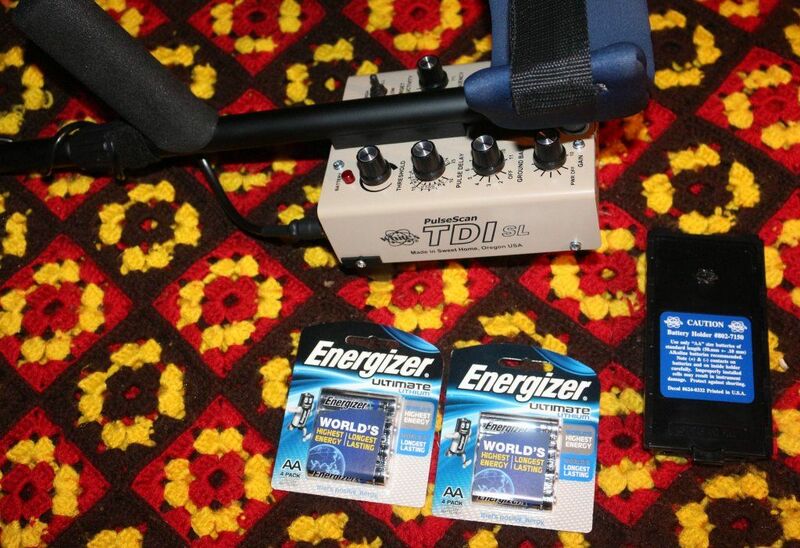 Because the batteries used are a lower voltage, the depth capability isn't quite equal to that of the two other TDI's. As such, the cost is a little less. 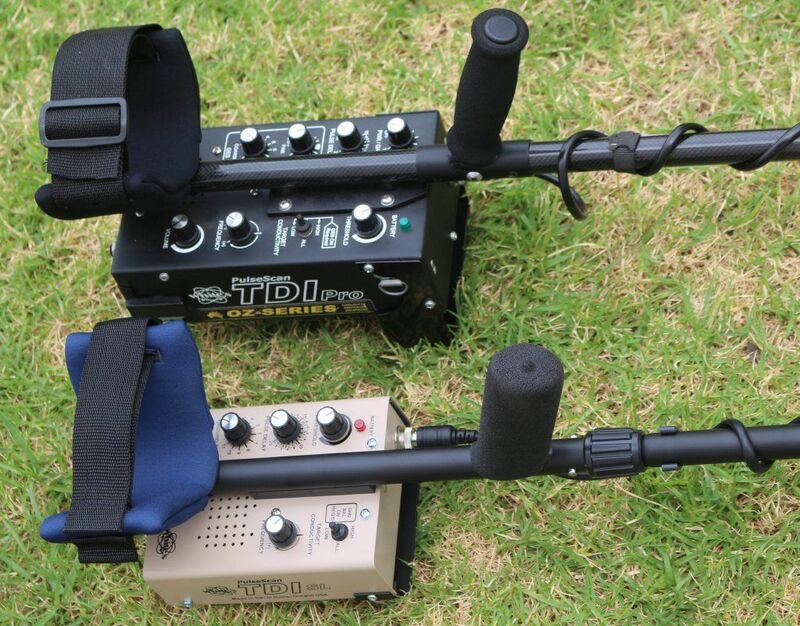 Another thing to Note is the TDI and the TDI Pro have more depth when the Ground Balance is Turned Off, Where as the TDI SL has better Depth when the Ground Balance is Turned On, Also noting that in Ground conditions like those found in Australia keeping the GB systems turned ON eliminates most if not all Ground noise which closes the Depth Gap between these Two machines, Also Upping the Voltage in the TDI SL also boosts it's Depth making closer to that of the TDI Pro. The most important Issue with any of the TDI Series is getting them to see Tiny Gold, If you can find any Coils that can do that then the TDI Series are great Machines, If a person wants to find Gold with the TDI's then forget the Factory Mono and the Duel Field Coils, With the right Coil a TDI will come Alive. 0.143g flat nugg at 6cm through a 1kg x 3cm thick piece of solid ironstone with e the coil approx 3cm above the rock. Ground bal = 9 .5 approx. Fine GB = 50%. There was still some EMI. Tone was weak but noticeable. The TDI Needs a Coil that can see bits that weigh 0.05 down to 0.03 and 0.02 grams, But unless they have had Lukes Mod done in standard form they just can't see bits that small. My TDI can see 0.05g in an air test no probs at approx 4cm. 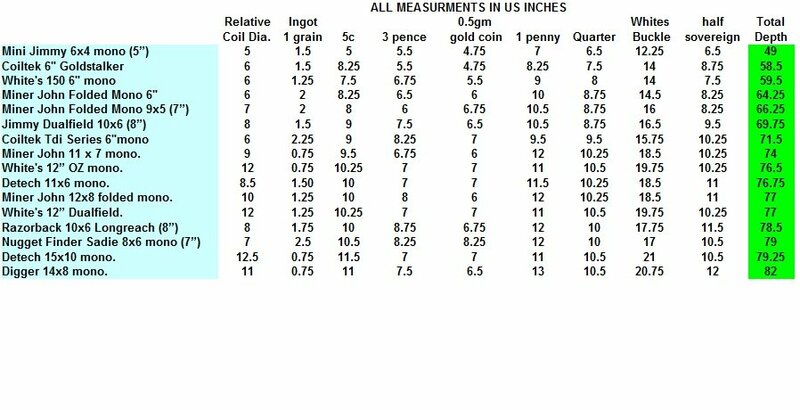 I doubt that I could see 0.02g bit of gold let alone detect it with the TDI . If I was in an area where the gold was around the 0.02g mark I would bag up some of the dirt and dish it later and get on with finding some real gold. It would be better to dish that size gold. Imagine chasing a tiny bit for 10 to 20 mins in the stinking heat with a detector that can give a loud signal on such small gold making you think it could be a large nugg only to find an almost invisible bit of gold when just ahead of you there is a chap with a lesser tecta than yours that can only signal well on large gold that you may even have laughed at and told him that he had no hope with that detector.You need a Minelab PI here mate, who then pings a biggie while you have been wasting time on a flake. Sure he may have walked over a stack of tiny tidlers but the time taken to recover them would be hours not a minute or two. Yes I know gold is gold and a lot of a little makes a nice bit of gold but some of it just isn't worth the effort of recovery unless you can recover it all in a short amount of time. This is not necessarily my belief but is simply another point of view. A year on I should mention that the Nugget Finder 14 x 7 did not perform as well as other coils, Miner John and Detech had it beat on the Tdi Pro. It went back to it's owner. The Tdi Pro is a fussy old girl and some coils she loves and others less so. I'll leave it to the experts to work out why? I can testify that the Sadie 8 x 6 is much loved, as is the Coiltek 6" Tdi coil. Both out perform Miner John's folded mono coils of similar size under all conditions and targets. 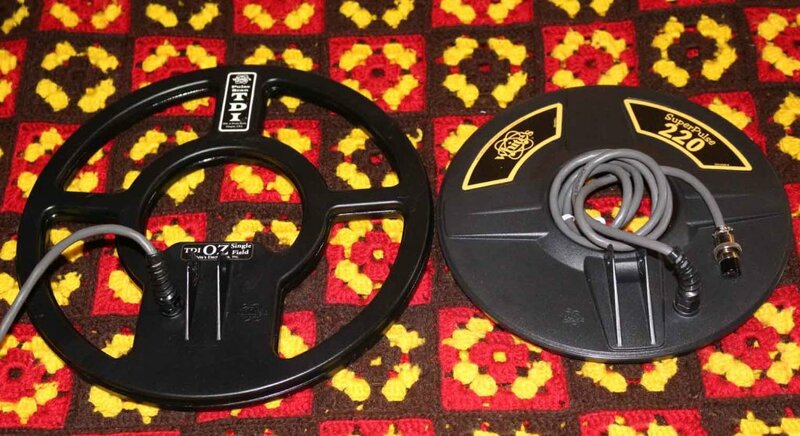 The larger Miner John coils are good performers, quiet and stable, perhaps most important is the decent build quality and super light weight. That 14 x 8 Digger (made by Miner John) coil is my beach babe and balances well on both Pro and SL whilst bringing home the goodies.. I hope Miner John recovers from the fires that destroyed his home and business in California. Having owned a Tdi Sl and the Tdi Pro, in my experience a standard Pro will outperform a standard SL under all conditions. Since I've got both I can confess that at times I prefer the SL, weight, decent performance and that oh so sweet threshold do entice. If depth were the only consideration then the Pro would be the obvious choice for me. The Pro is my prospecting machine and when family and friends accompany me I use the Sl as my loaner machine. The MXT used to perform that function but in heavy ironstone and hot rock infested ground the SL is much kinder to the inexperienced. I spend money on different big boy toys, aka drones, metal detectors, cameras etc. If you prospect seriously enough to invest in expensive 4x4 vehicles and camper trailers, then go the Minelab, no argument from me. If like me you have a finger in every pie and spend more time on the beach than the goldfields then the Tdi Series machines, be it Pro, Sl or Beach Hunter are nothing short of excellent. I don't like menu's or buttons, the Luddite that I am loves the switches etc, the Tdi is the right fit for me. detectorguy the SL is not a Minelab but that can be a good thing. Next time you swing your Tdi Sl, perhaps with a Sadie or Coiltek 6", think of the light weight, magnificent balance and excellent bang for your buck. No wires or external batteries, back pain, bungee cords or cables. 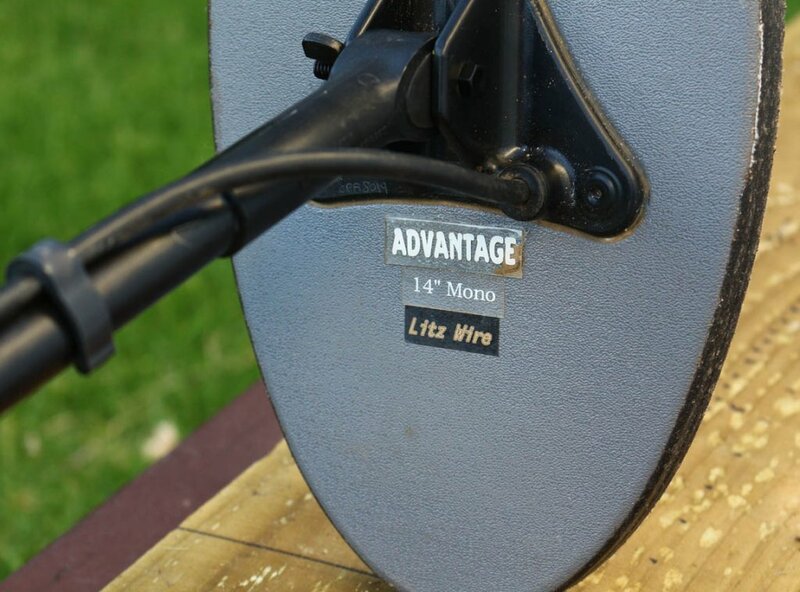 That sweet threshold hum, immunity to EMI, it may be a niche machine for some, but what it does it does well. The new generation of Minelab machines are magnificent, they are in a league of their own, no arguments from me. Does that mean that I cannot enjoy the Tdi? A nice all rounder and on the beach or the goldfields, I feel it does well. I ordered a nugget finder 8x6 sadie yesterday 2/15/2019 and it will be raining here in Sacramento Ca for the next week while my coil is in transit. Rivers around here will be pushing the rocks, and gold around. When it finishes that I'll be out there with the TDI trying to find where it pushed the gold to this year. Maybe I'll take a trip to the desert see if I can pluck a nugget from there. Best of luck sniping for gold, if your detector sounds off on a target in a crevice make sure you clean it out and put it through a gold pan. The target might be rubbish but their might be some smaller golden heavies as well. Funny how rubbish and gold seem to share the same crevices in the rocks in the rivers where I go. When panning a river or creek I bring a machine along to find the rubbish and in so doing end up with gold in the pan. More often than not the gold is too small to detect. Good headphones make all the difference, amazing how the sound of running water or just the wind in the trees can drown out small whispers.. I've got a Detech 8" mono for a while so I thought I'd give it a go, always suspected this size coil would be ideal, given my experience with the Sadie. I've done the usual air tests and it was better than the Sadie or equal. Had an opportunity to give it a very quick ground test near Creswick. All tests done on the Tdi Pro. Air test was full gain and ground balance OFF, pulse delay was 10, frequency centre. Sorry didn't record exact settings with ground test but ground was mineralized. 1 grain ingot 12cm, same as Sadie. 5 cents was 35cm, beat Sadie by 5cm. 3 pence was 35cm, beat Sadie by 5cm. .5 gram gold coin was 30cm to equal the Sadie. 1/2 Sovereign was 38cm to beat Sadie by 3cm. Penny was 37cm beating Sadie by 3cm. Buckle came in at 60cm. Ground tests were a bit rough since time was short. Settings not recorded but depths on .5gram gold coin was 19cm, Sadie was 21cm . Half Sovereign came in at 30cm depth, beating Sadie by 3cm. So Sadie wins on the small gold but Detech 8 mono might be better as the size increases. That Detech looks to be very well made and solid, very quiet and well behaved. Mounted on Minelab lower rod, balances nicely and no weight problems, very nice quality coil. Detech 8" mono seemed to nip at the heels of the Sadie on smaller gold, jury is still out since tests were rushed. It goes very deep on some targets and could be close to the ultimate all rounder. Early days and I'll report back later with more detailed results. I've been asked to put some Lithium batteries in the new Special Edition Tdi SL so it's running on 14.8 volts and compare it to the Tdi Pro, no problems, happy to do it but just need a bit of time to do it properly. Whites may have made some minor cosmetic changes to their Tdi Sl plus other changes after the SPP hiccup issues were resolved. Not sure but we can find out if 2018 machines outperform 2012 models..? Detech 8" mono is a real sleeper. Kind of looks made for the TDI with the white, black and gold colour scheme. I've got the Tdi Sl as a loaner for family and friends. My brother and friend who accompany me feel that they are disadvantaged with the 'lighter' machine, I'm inclined to agree but so far have not put it to the test. It is light, easy to use etc and I'm not giving up the Pro. The 'new' Sl looks good and I like the new handle, I'm using it on the beach a lot and so far it has performed well. It will gets its first taste of the goldfields shortly. The Pro and Sl have a strong family resemblance with build quality, weight and balance excellent. Just a few more photographs and next post will be a proper collection of coil tests and detector comparisons. I think it looks good in this colour. No screen or touch pad. It has been quite a while since I've used these disposable lithium batteries, cost being the reason. 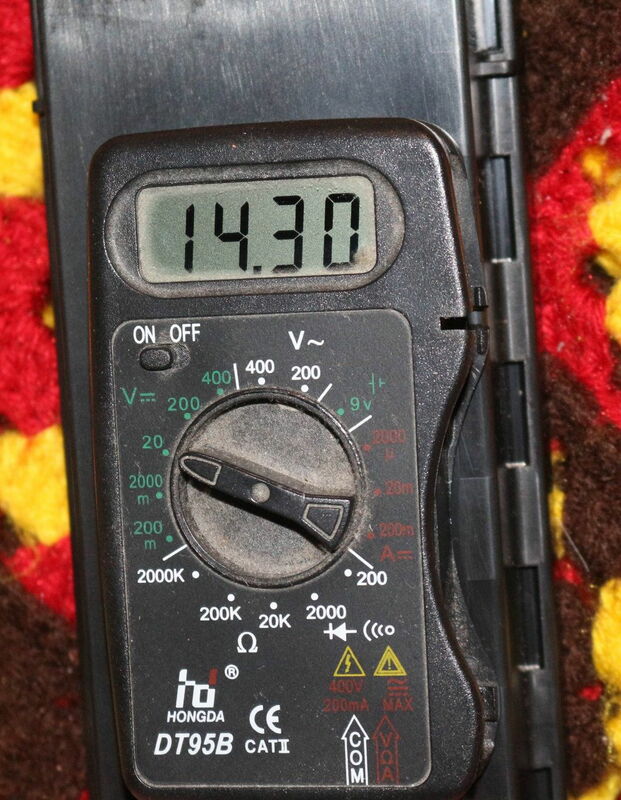 Voltage comes in at 14.3 not 14.8 as I had hoped. Just a few images to confirm tests, results to follow. I'll start with the dreaded air test shortly, ground testing will follow in good time. I made a 9 Cell box and with those batteries it will give out about 16+ volts, It was me who wrote the thread over on DP about the TDI Battery box conversion. Yep lots of options to increase voltage, 4x 18650 is looking good right now. Air test with gain on max, conductivity on ALL, delay on 10, frequency in the middle, ground balance off. Ground testing will tell the real story though later on. 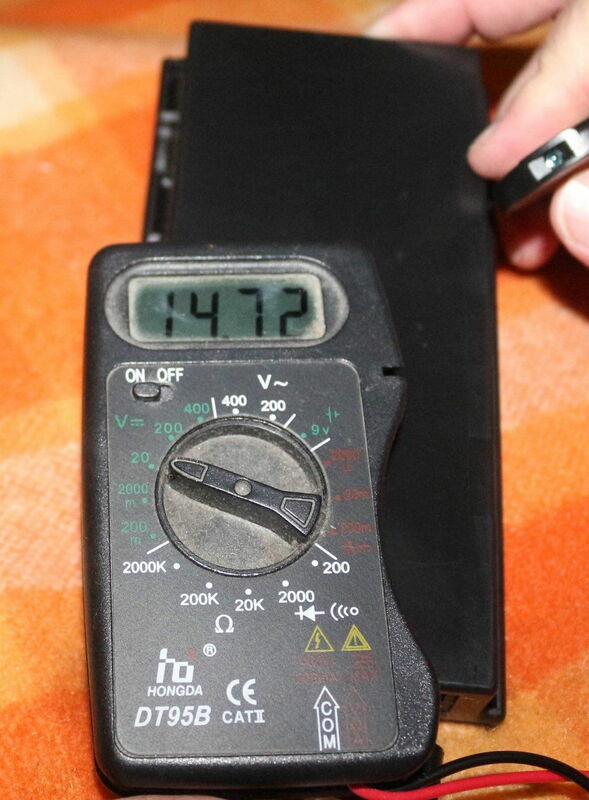 Again voltage was 14.3 just prior to test. No EMI issues today, Detech seems immune when on Tdi SL. Time to take the dremel tool out and butcher a battery box, 4 x 18650 should do the trick. They are hot fresh off the charger but settle to an honest 14.8+, no stories of machines blowing up yet so I'll give it a go. To date I use those Ukrainian 3 x 18650 packs instead of White's factory rechargeable packs. be careful with those 18650's because even when they have sat for 24/48 hours they still hold 4.2v which is 16.8, the saffty limit on the TDI's is closer to 16v, Max. 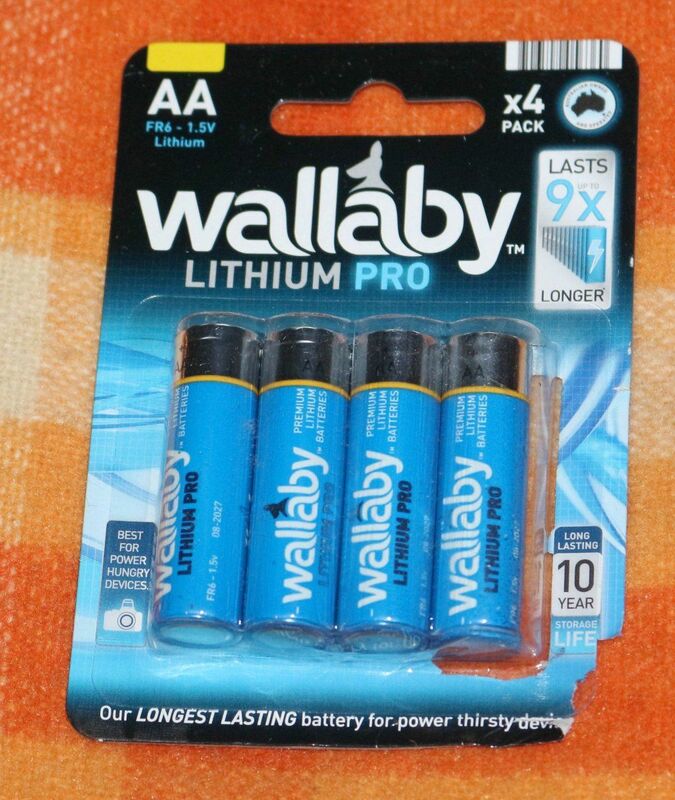 Diy 4 x 18650 battery pack is on the list of things to do, but in the meantime... Bought some alternatives to the Energizer batteries, Wallaby disposable lithiums. Battery pack comes in at 14.72 Volts. So I'm happy at the voltage. Easy to spend $100 on fuel when I go prospecting, same for a night in a motel. That $100 buys 48 of these batteries. Cheaper than Energizer and a little hotter as well. Another air test to follow, this time with the supplied Miner John folded mono coil that came with the Tdi SL special edition..
That Voltage at 14.72 looks good enough for me, for the time being.. 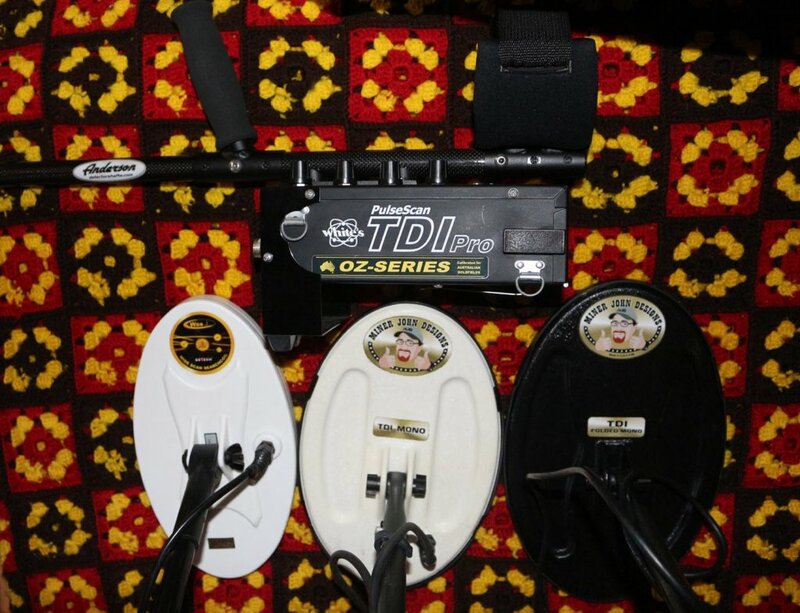 I got them off fleabay in Australia, can't argue with the price when compared to the Energizer's..
Fresh alkaline Duracells come in at 12.8 volts total.. ok another useless air test..
Tdi SL Special Edition Gain at MaX, Frequency in the middle, Pulsed at 10, Ground Balance OFF. Miner John Coil. Should mention the Miner John coil didn't pick up any EMI, it runs smooth and quiet at all times, beach and goldfields. 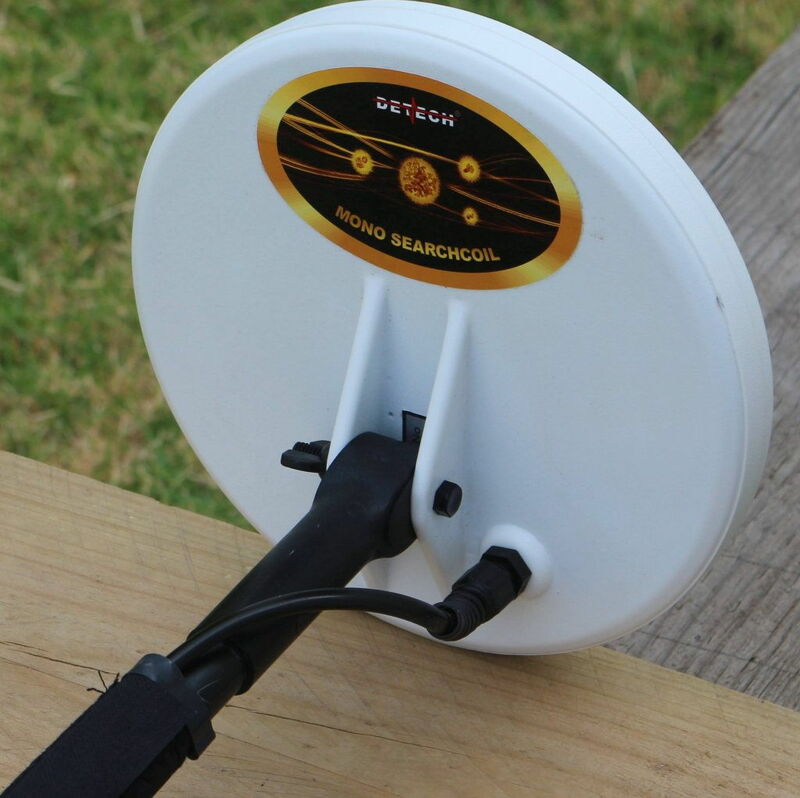 Balances well and is very light weight, well made no issues. Uses Whites lower stem and coil fittings etc. For such a decent size coil is is very light weight. After reviewing my results I'll include a quick note, early air tests were done with gain at 5, more recent tests were done with gain at MAX. My home WIFI was replaced with well shielded cables, so far less EMI, making MAX on the Tdi Pro nice and smooth. In the air tests that adds about ten centimetres, roughly; to the buckle for example. Ground testing results are not effected since they were done out in the field. The SL seems more resistant to EMI than the PRO, probably due to the filtering to get that smooth threshold. Never been able to find ground on the goldfields that allow MAX gain with the PRO. Max Gain is only on the beach and with the ground balance off as well for great results. 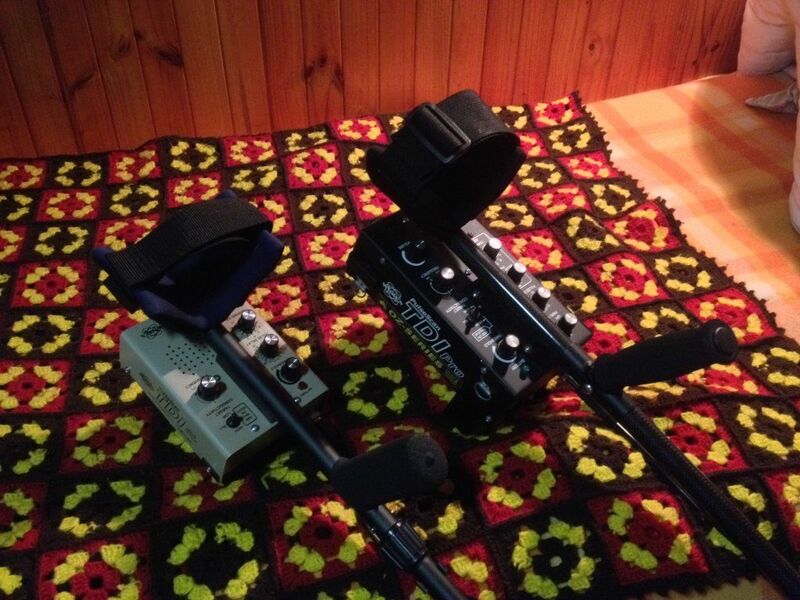 The SL will sometimes allow MAX gain on the goldfields, particularly stable and smooth in the LOW setting, whilst passing on some ground noise in ALL. I always bring a test nugget to 'tune' the detector for the location. Play with the settings to get the best performance for that location. 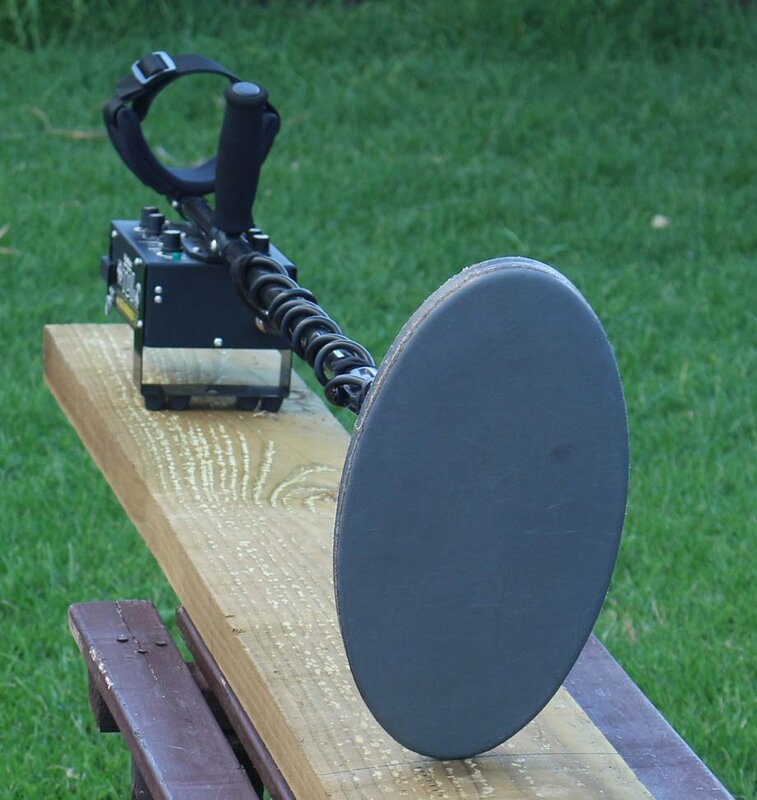 Some coils will pass on some, more or less, ground noises when pushed for depth and sensitivity, these noises are easily distinguished from targets most of the time but not always. The coils do behave differently from one another in regards to smoothness and stability in high mineral soils. Perhaps something I should have explored in more detail. Sometimes we need to pass that coil over some ground noise again, maybe from a different angle and even play with the conductivity switch or other settings since some hot rocks etc can and do sometimes sound like a possible target. I only need to grab a VLF detector in hot rock infested ground to remember how much better PI machines operate in such areas. 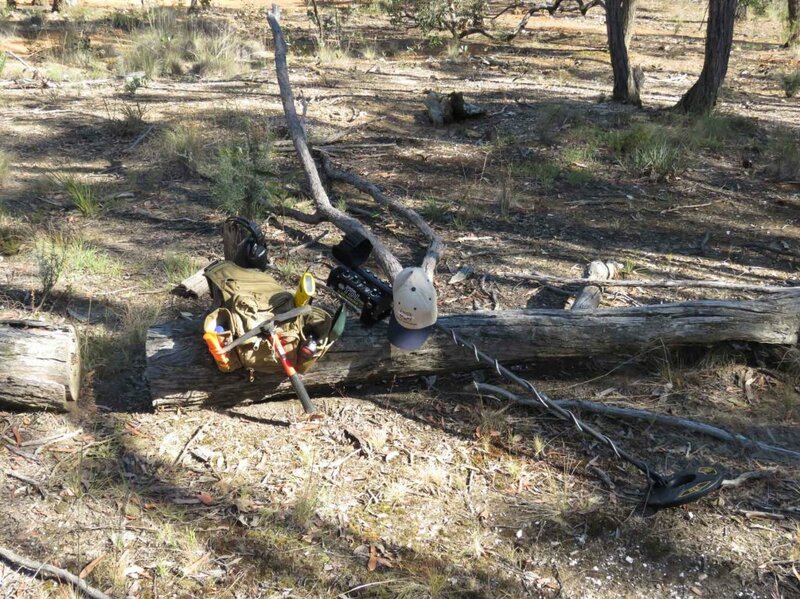 When working near Rifle Range Rd in the Whipstick I did swap my Tdi Pro for my MXT, but only after about 100 full metal jacket 303 British projectiles were dug by me. Lots of bullets, boot tacks, buttons and other bits and pieces but no gold. I cannot set the Tdi machines to ignore bullets or any lead targets, too similar to gold. Maybe I'll find another spot well away from old rifle ranges..? So max gain is not always possible or desirable, for me the goal is to set the machine up to be smooth and stable which can only be done at times by turning down the gain.